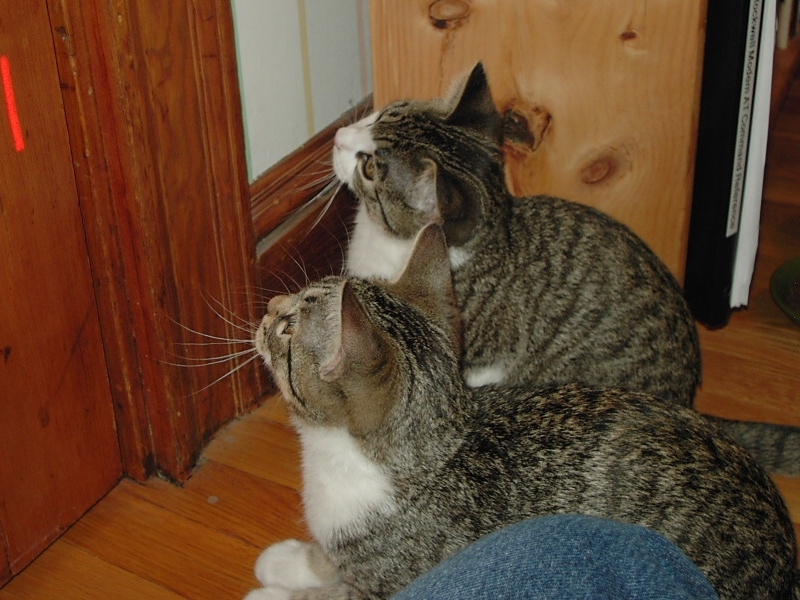 It was on this day in 2004 that a litter of kittens were born that included the brothers which we would adopt (along with the elderstatescat Emily) just under four months later on June 14th, 2004. Ten years later, our Catzilla brothers are still the anchor of our little kitten farm. Make no mistake, they are getting older. Whitey still seeks out the highest vantage point in the room, but he is if anything more sedate than ever. Billy is still a mighty hunter of cat toys, but while he may chase up six foot towers as many as eight or nine times during play time, he may take a break after as little as two or three. As a catten, eight towers would have just been warming up. Of course, Billy & Whitey still scoff at the concept that anywhere in the house is truly off limits to them -- if anything, Ssscat laden kitchen counters are more fun than cat towers (especially to Billy). May we still be shooing our senior princes off the counters ten years from now.